Charles Henry Root (March 17, 1899 – November 5, 1970) was an American right-handed pitcher in Major League Baseball for the Chicago Cubs for sixteen seasons from 1926 through 1941. He holds the club record for games, innings pitched, and career wins with 201. He was the last player born in the 19th century to pitch in a Major League game. Born in Middletown, Ohio, Root began his career on April 18, 1923 with the St. Louis Browns. On October 1, 1932, he threw the pitch that Babe Ruth allegedly predicted he would hit into the seats in the 1932 World Series at Wrigley Field in Chicago (see: Babe Ruth's called shot). Root, however, insisted that Ruth had not pointed to the bleachers. 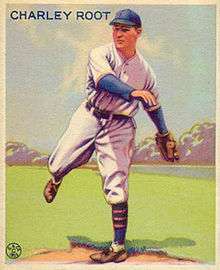 His best season was in 1927, where, despite a 3.76 ERA, he won 26 games. He had a career-low 2.60 ERA in 1933 while winning 15 games. He went to four World Series with the Cubs and lost all four. He died at age 71 in Hollister, California. As quoted by Baseball Legends: The Charlie Root Story, by Joseph E. Bennett, Jan. 1995 Knight Templar magazine "Root was one of the fiercest competitors the game ever knew... his cigar-chomping, no-nonsense visage was one of the most intimidating tools in his baseball arsenal." According to his daughter Della, two days before his death he told her, "I gave my life to baseball, and I'll only be remembered for something that never happened". He is frequently referenced as a source of the name used for "root" system accounts under *BSD operating systems like FreeBSD, OpenBSD and NetBSD, which share the name "Charlie Root."